Richard Taylor's latest painting, recreates an encounter on 19 February 1945. As dawn breaks over the Pacific, a determined force of Japanese Ki-44's launch a surprise attack on a large formation of USAAF B-29 Superfortresses as they approach the Japanese mainland. B-29 gunners let rip as one fighter flashes past, with a second fighter closing at high speed. Chunks of the B-29's port wing and aileron have been taken out in the initial attack, and with another Japanese fighter fast on its tail, the outcome of this particular encounter hangs in the balance. 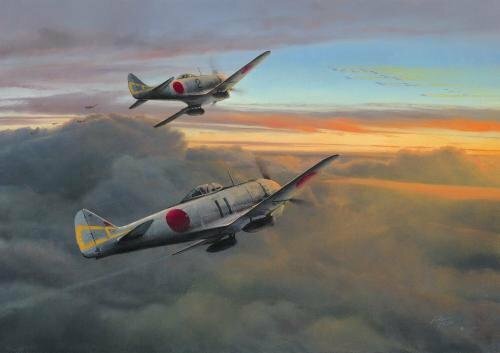 THREE veterans of the Pacific War who flew B-29s in the assault on mainland Japan, have added great authenticity to Richard Taylor's new Limited Edition by signing each print. The edition is also signed by the artist, and individually hand numbered. 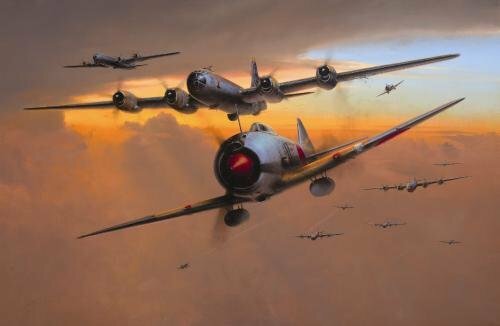 With the onset of dawn, Captain Yoshio Yoshida, an Ace with 6 victories over B29s to his credit, together with other pilots of the 3rd Chutai, 70th Sentai, power their Nagajima Ki44s into an attacking position ready to strike the strong incoming force of B29 Superfortresses in the distance beyond. Within a few minutes another titanic clash will erupt in the skies over Japan as the B29 crews fight their way through to the target.